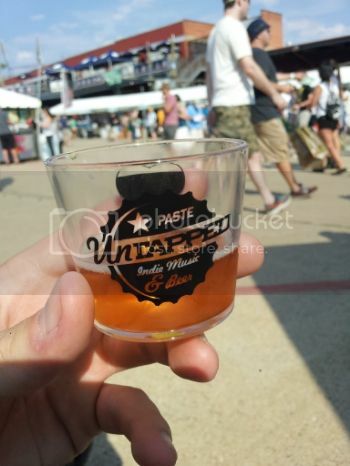 Another successful Untapped Festival has come and gone. The second annual beer and music festival ran smoothly despite the typical Texas summer heat. A lot of exciting news was revealed while attending the Untapped festival and talking with all of the different brewers and volunteers. First exciting bit of news is that Lakewood will start bottling their newest specialty Lion's Share series some time next year. The first installment of this series was available in the imperial bourbon barrel version of their year-round Hop Trapp with an addition of brettanomyces for an additional funky kick. Another welcome surprise was local brewery, Peticolas Brewing Company, brought along their freshly tapped barleywine, The Duke. Kegged back in April, The Duke was publicly released a few months ago and has only been available at special occassions. This smooth beer comes in at a whopping 12% ABV but the alcohol strength is well hidden. Other breweries also brought additional un-advertised beers like New Belgium's La Folie sour ale and (903)'s General Sherman's Brown Ale. Fall is here, which means pumpkin beers are out in full force. Not all pumpkin beers are crafted the same. Some rely more on fall spices found in pumpkin pie, or some brewers go for more of a raw pumpkin flavor. Several pumpkin beers were readily available at Untapped. The first pumpkin beer up is Dogfish Head's Punkin Ale. With a brown ale base, this beer has a lighter body and pumpkin spices on the nose. Though made with raw pumpkin, the pumpkin flavor is light. Talking to Dogfish Head Texas/Colorado beer rep, Nick Lensing, Punkin Ale should be delivered to the Dallas area by October. Next up is local brewery's Lakewood Punkel Surprise Cask. The surprise here is that they aged their seasonal Fall beer on rum soaked oak chips. In this variation, the oak chips really come out in the flavor along with notes of raw pumpkin and pumpkin pie spices. The Southern Tier Pumking was the pumpkin beer to try this year at Untapped. A completely different pumpkin beer than the other options. The thick sweet creamy flavor of this beer can even allow it be considered a dessert beer. Another Texas brewery with a pumpkin beer was Saint Arnold's with their Pumpkinator. As most other pumpkin beers start with a light-bodied base, Pumpkinator uses a heavy imperial stout. With a bit more of the pumpkin spices than other offerings, they play really well with the darker tones of the chocolate notes and alcohol warmth of the stout base. Other pumpkin beers that were also available include: Brooklyn Post Road Pumpkin, Samuel Adams Harvest Pumpkin Ale, New Belgium Pumpkick, and FireWheel Pumpkin Ale. Some people go to beer festivals to try the best of their favorite styles. Some go to try the unique, off-the-wall beers. If you read the previous article, the following beers were detailed as some of the top beers to try. As previously speculated, Indra Kunindra Foreign/Export Stout by Ballast Point is definitely the most unique beer available at Untapped. All I can say is "wow." I was not sure what to expect when first tasting this beer. Before even drinking it, you can smell the curry flavors immediately on the aroma. Bitter dark chocolate and spicy pepper notes make up the majority of the flavor, and black pepper dominates the lingering flavors in the finish, even well after the beer is gone. As previously mentioned, Lakewood's first beer of their Lion's Share series is a bourbon barrel version of their Hop Trapp with a 'brett' addition. Upfront, it has the same flavors as the original Hop Trapp with some citrus fruitiness and hoppiness on the tonque. The finish of the beer is where it gets interesting. At first you get notes of the oak and bourbon from the barrel aging, but then as it finishes, you get hit with the funk from the 'brett.' The lingering effervescence is very similar bleu cheeses. They even suggest to pair it with gorgonzola as a cheese pairing.